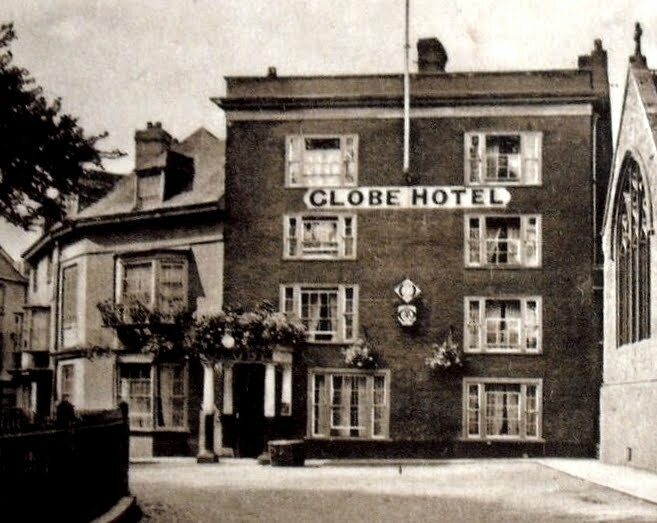 Another part of Exeter's past which went up in smoke on 04 May 1942, the Globe inn had been one of the most prominent inns in the city for over 270 years. 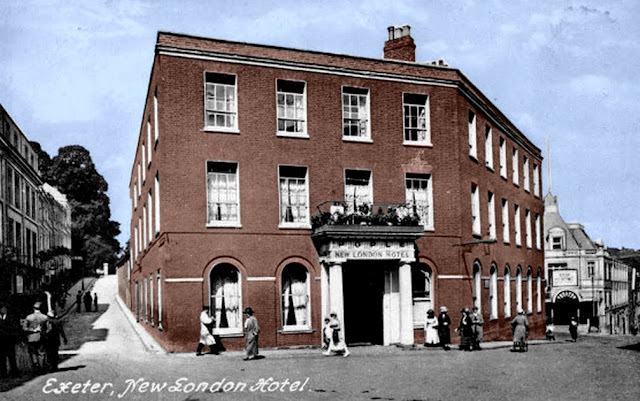 The inn, also known as the Globe Hotel, joins the former New inn, the Chevalier inn, the New London inn, the Old London inn and the Country House inn as just some of the many historical inns and taverns which have been destroyed over the last century. The Globe inn occupied a prime site, facing out into the Cathedral Yard, backing onto houses which fronted onto the busy thoroughfare of South Street at the rear. 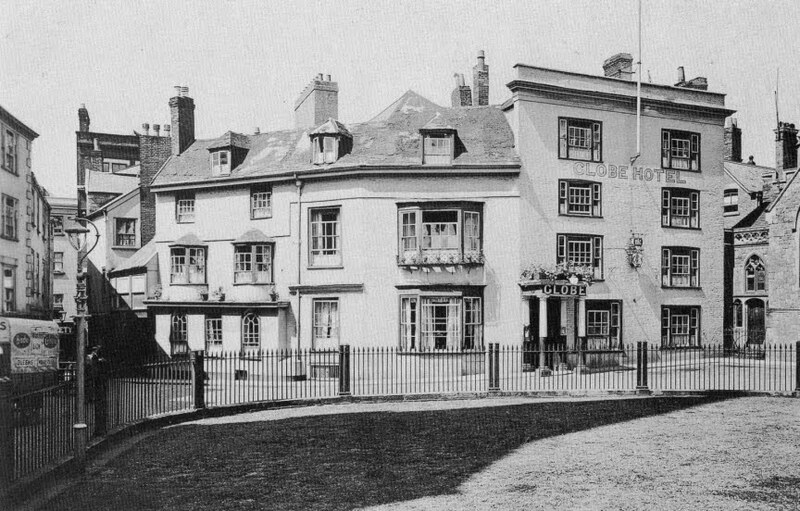 In his book, 'Aspects of Exeter', local historian Peter Thomas admits that no-one knows exactly when the Globe inn was first established. 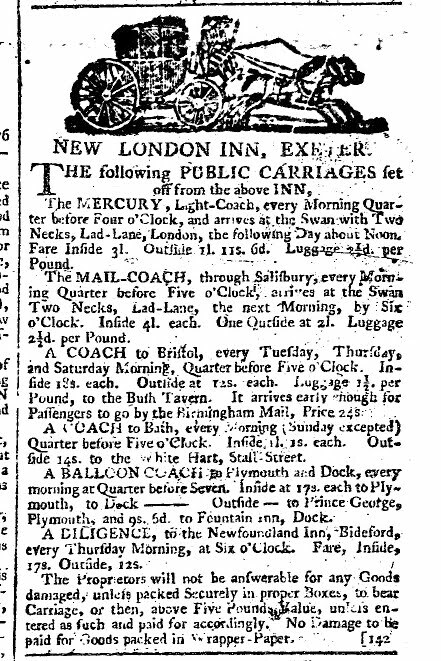 The earliest reference to it as an inn appears in the parish register of the nearby church of St Martin. The register records the baptism of Thomas Fowler, the son of "William Fowler, tapster at The Globe", on 25 October 1675. A tapster was essentially a barman so the Globe inn was certainly open for business in the 1670s. The image right shows a modern aerial view of the Globe's location overlaid onto which is a detail from the 1905 map of Exeter. 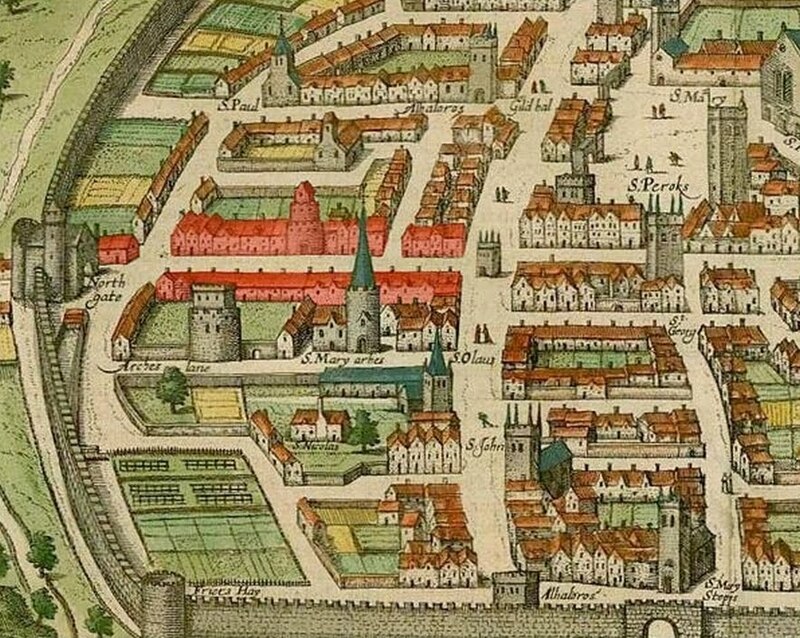 The Globe is highlighted in red, with the curved facade facing out onto the cathedral precinct. Of particular note is the very narrow alleyway, just five feet wide, which lead down the side of the Globe and into South Street. This was known as Little Stile and was one of the original 13th century gateways into the Cathedral Yard. The gateway structure itself was removed in 1820 but access remained as a right-of-way for pedestrians until it was obliterated by post-war redevelopment. South Street runs to diagonally to the south-west. At least part of the Globe itself was considerably older than the late-17th century. The photograph below left shows the full extent of the rambling Globe inn prior to its destruction. The oldest part of the Globe was the section to the left, with the dormer windows set into the roof. This had been constructed as a private house, possibly as early as 1600, but by the mid-17th century the house had been subdivided into two separate tenements, one of which was the original Globe inn building. Over the following century the Globe expanded to include not only the second tenement but also a later extension (masked by the plain stucco facade to the right which was added c1800.) Part of St Petrock's church is visible to the far right and the narrow entrance into the cathedral precinct known as Little Stile is to the far left. Up until 1942, the interior of the Globe inn still retained much of its character, with oak panelling, carved doors and 18th century bow windows. 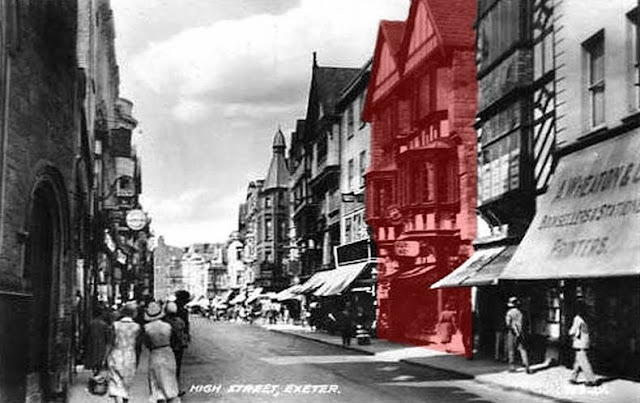 The Globe was, frustratingly, another of Exeter's landmark buildings which was destroyed before it could be properly surveyed and so its precise architectural history will probably always remain unknown. The history of the inn ended on 04 May 1942. Incendiary bombs dropped onto South Street as part of a 'Baedeker' air raid ignited much of South Street and the flames spread to the Globe inn. By the following morning all that was left standing were the walls. Everything else had perished in the flames. Presumably the ruins were unsafe and so the remains were cleared away as part of the post-war rebuilding. The post-war reconstruction of the area is insipid. 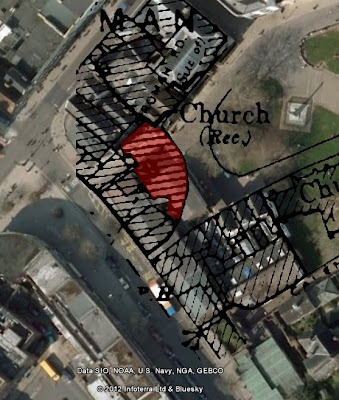 A wide entrance right was constructed over the site of the Globe, giving easy access to the cathedral precinct. 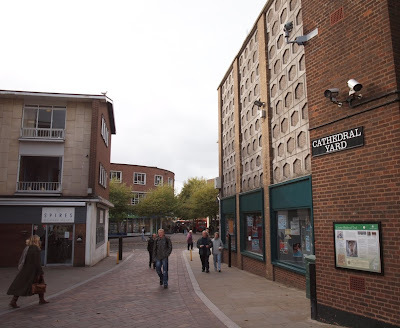 However this also had the unfortunate effect of opening up views from the Cathedral Yard into the 1950s wasteland of post-war South Street and the rebuilt top of Fore Street. It also involved the scandalous demolition of a surviving half-timbered facade from c1600 which stood at the back of No. 72 High Street. According to Pevsner and Cherry, "the ceremonial steps have the effect of "unfortunately focusing attention on the unworthy rebuilding of the war-damaged SW corner of the Close". 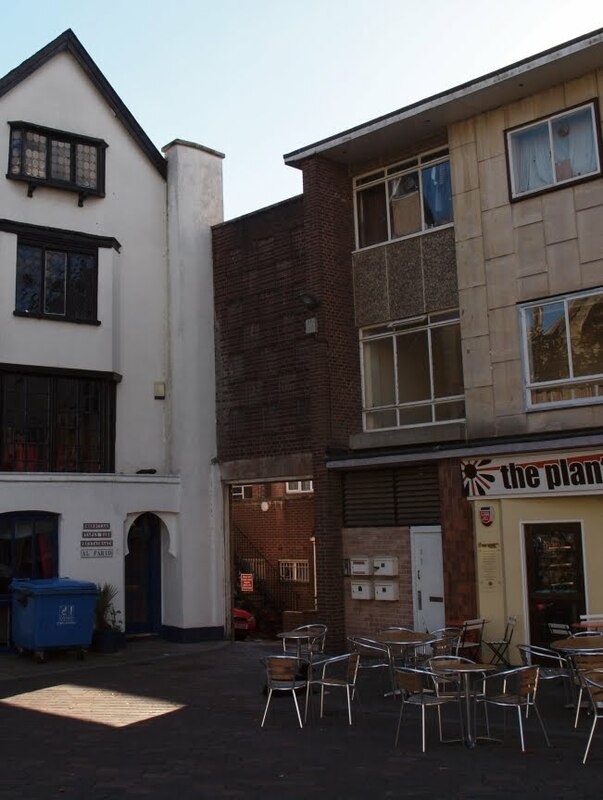 As with most of the buildings which arose in Exeter after 1942, the architecture which replaced the Globe Inn was uninspired, anonymous and pedestrian. Where the Globe Inn once stood there is now a three-storey, low-roofed shack of the utmost mediocrity. The wall to the right of the new entrance is almost as bad. Made from concrete blocks with a hexagonal motif, it looks particular dated and cheap. The city council's own conservation report for the area acknowledges that the post-war redevelopment is a "major disappointment in terms of how it defines this important space". But perhaps the most unforgivable act of the reconstruction here was the obliteration of Little Stile. Since the late 1200s people had used this route to enter the Cathedral Yard but after the war it was blocked by redevelopment below and it now only leads into a small service area. 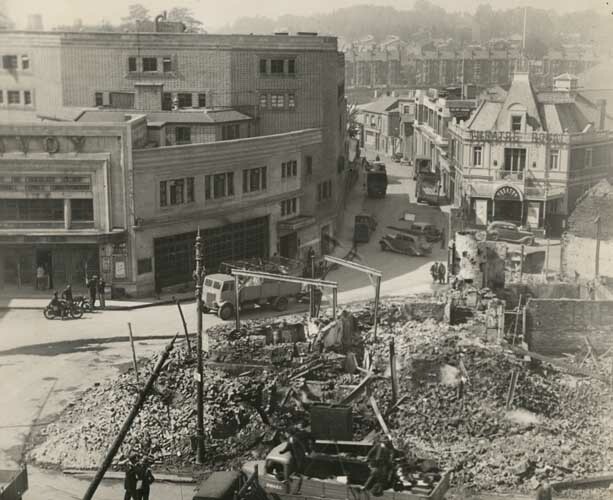 It's hard to imagine the sheer arrogance of either the town planner or local authority which could destroy a part of the city's long history so casually and after so much had already been destroyed during World War Two. 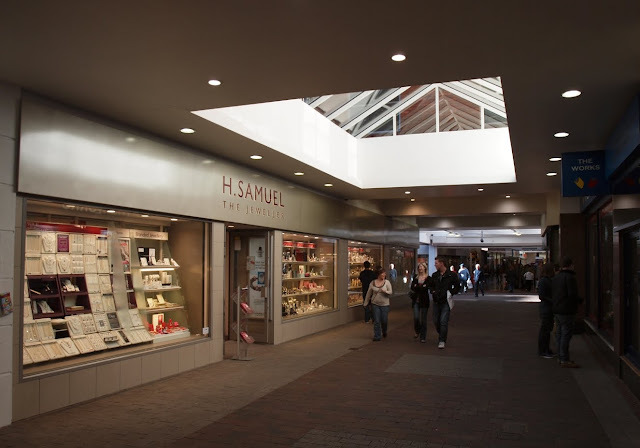 If you go down the High Street today and turn right into the abysmal 1970s Guildhall Shopping Centre you'll find a jewellers, H Samuel, inside which is something entirely unexpected. The construction of the Guildhall Shopping Centre almost completely trashed one of the few remaining areas of Exeter's historic cityscape, so it's incredible to find an overmantel and window dating from the time of Elizabeth I totally surrounded by modern development. 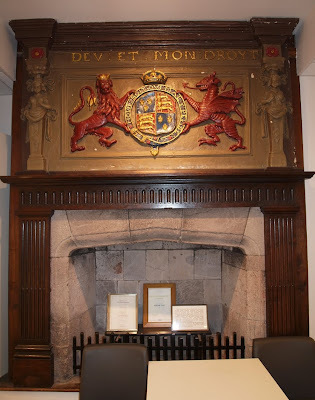 There's a little framed information card next to the overmantel which reads as follows: "This interesting Coat of Arms and fireplace occupy their original positions and were discovered during the purchase of Messrs. Stead & Simpson Ltd. The heraldic panel contains arms, supporters, crest and motto of Queen Elizabeth, and has been restored in the original colours. 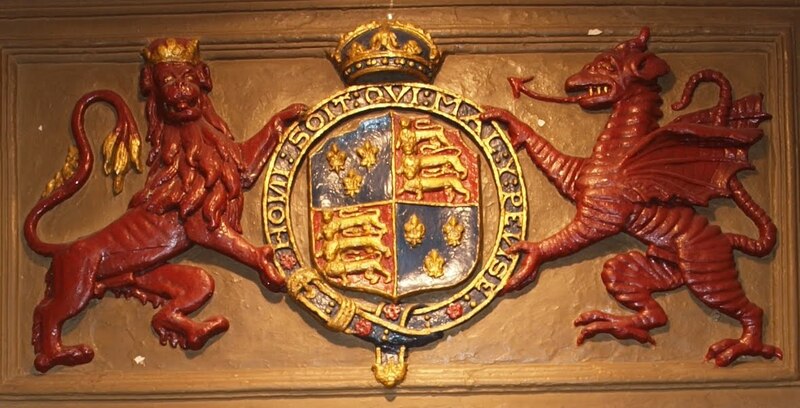 The red lion is unusual, being generally depicted in gold. The room was evidently the parlour of a wealthy Tudor merchant and originally had a fine plaster ceiling and oak panelled walls. An oak window containing the old glazing may still be seen "in situ" on the right of the fireplace, which is etched in the right hand with a name and date". 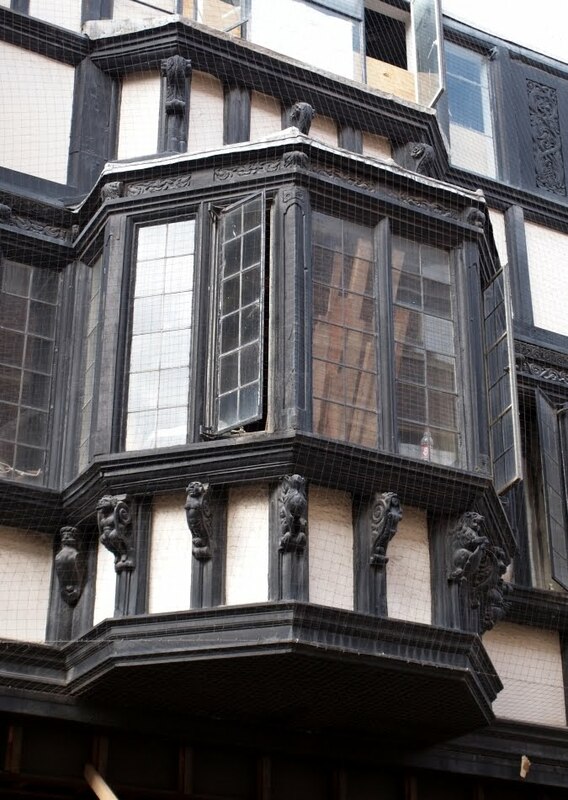 Absolutely nothing else remains today of the Tudor house apart from the window right and overmantel above left. So what happened? The construction of the Guildhall Shopping Centre resulted in so much demolition that it's impossible to say exactly what was torn down to build the present-day jewellers in the 1970s. 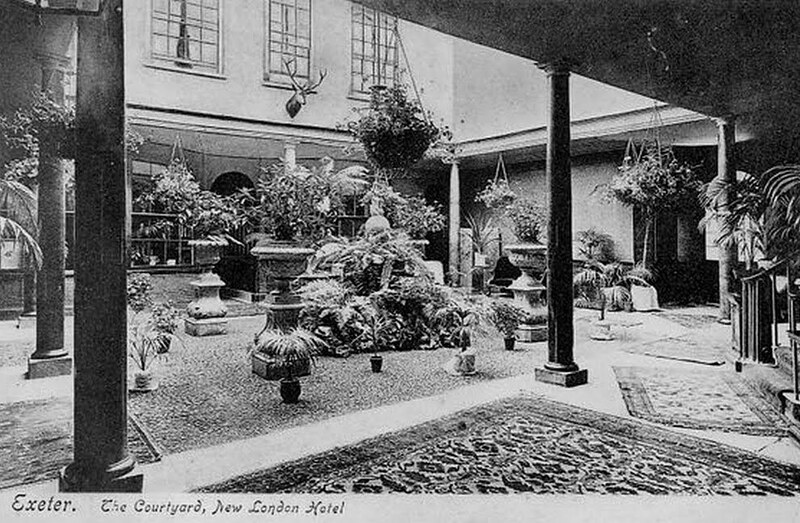 However, in the Westcountry Studies Library are a series of photographs dated 1914 which show the overmantel and window in their original setting. It seems that Messrs. Stead & Simpson (a local firm of shoemakers) purchased the property in 1914 and set about modernising it. During the process substantial remains of a large, high status Elizabethan merchant's house were discovered and photographed. 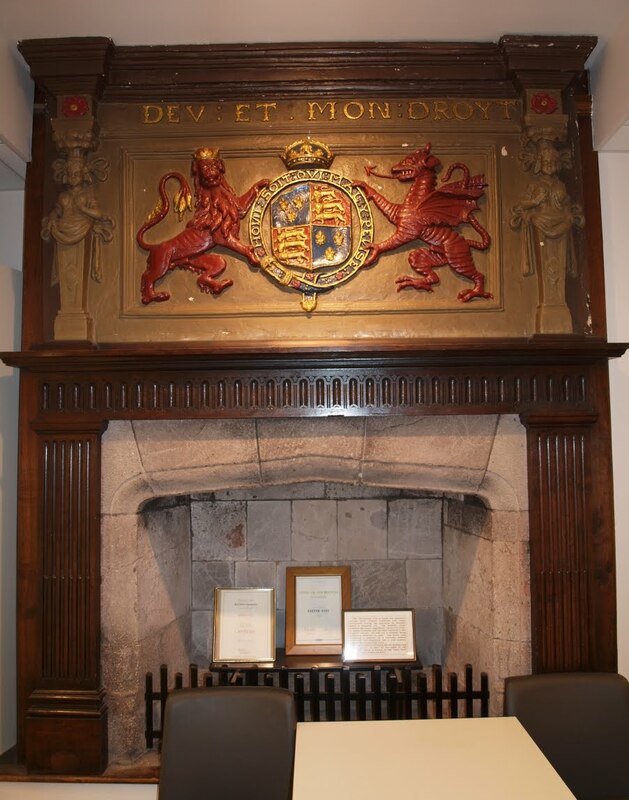 The photo below © Devon County Council shows the overmantel in the same position it's in today. Remains of a plasterwork ceiling can be seen along with some sheets of oak panelling resting against the wall. Also visible is a smaller window to the left of the overmantel which originally looked out into Parliament Street. 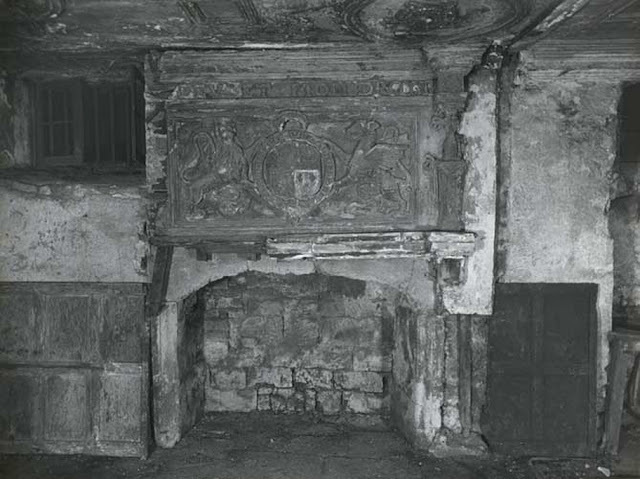 Another photograph shows that a second, simpler fireplace also survived at least until 1914. A third photograph shows a room upstairs with another fireplace. Another question that arises is whether the Tudor house originally fronted onto the High Street. The Westcountry Studies Library has the 1914 photographs labelled as being from a house in Parliament Street. Parliament Street once ran down the side of the property. 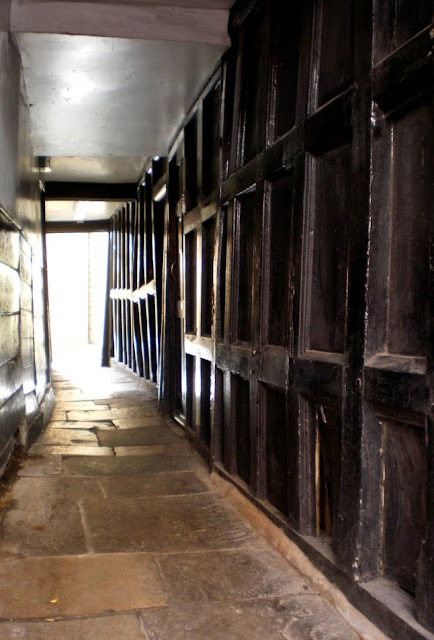 Little more than an alley, it is one of the narrowest streets in England so it's highly unlikely that a magnificent Tudor townhouse opened directly onto it. It seems that the Stead and Simpson refurbishment of the building in 1914 was highly destructive. Harbottle Reed lamented in 1931 that an "elaborate strapwork plaster ceiling has been removed as a thing of little worth". 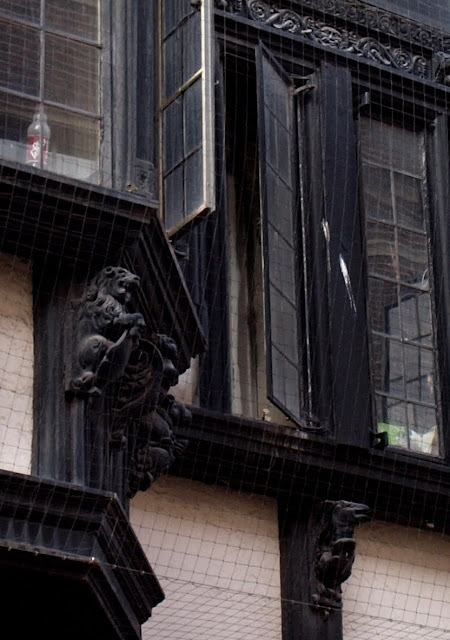 But it's likely that significant remnants of the fabric of the Elizabethan house did remain intact other than the overmantel and the window. Fortunately, in March 2011, the Exeter Archaeology unit wrote a detailed report on No. 195 High Street. No. 195 stood nextdoor to No. 196 and the history of No. 195 was entwined with that of its neighbour. The history of the house with the Tudor fireplace was as follows: in c1580 a pair of townhouses was constructed on the site of a large tenement plot. 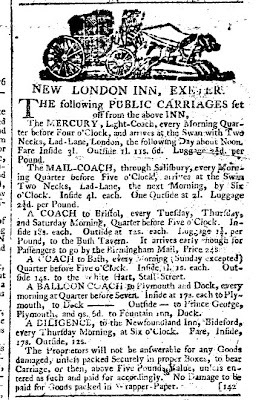 Such pairs were constructed fairly frequently in Exeter, as at Nos. 46 & 47 and Nos. 41 & 42, both still surviving on the High Street. These pairs were usually constructed with a front block and a rear block divided by a courtyard. At some point c1700 the front block of one of the houses, now No. 195, was totally rebuilt and turned into an independent property. The rooms in the rear block which weren't included in the division were then incorporated into the house next door, No. 196. This accounts for No. 195 appearing to sit on the alignment of the overmantel and window, No. 195 being the house to which they had indeed once belonged. 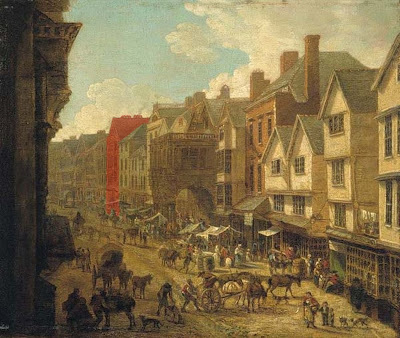 A painting of the High Street dating from the end the 18th century shows No. 196 when it still retained its original, gabled late-16th century facade. It is highlighted in red on the image above right and is depicted prior to the reconstruction of its facade c1800. No. 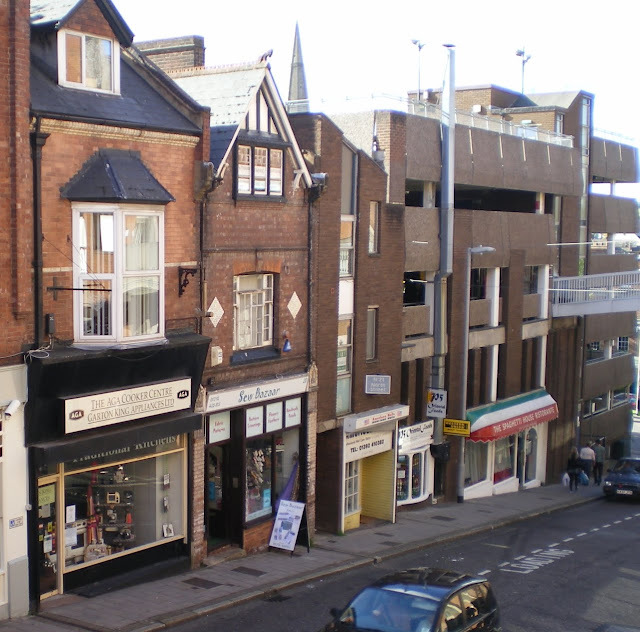 196, High Street was given Grade II listed status in January 1953. The 1953 listing text describes it as dating from c1600 with a much-altered 18th century facade. The description continues: "Interior: room at back, now part of show-room, has late C16 fireplace. Plaster overmantel with Royal Arms. Caryatid figures on each side. 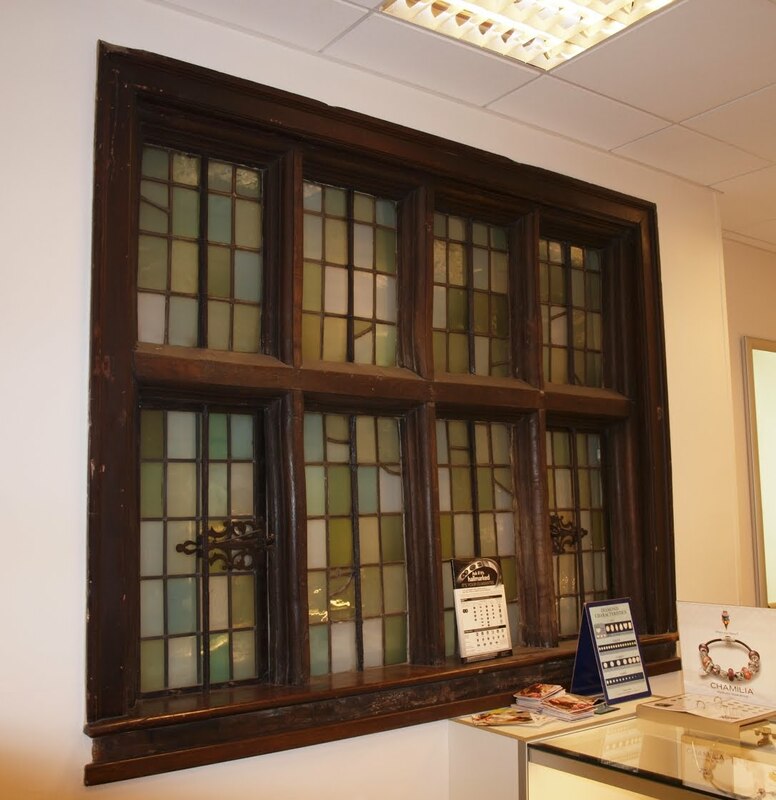 Nearby is 4-light mullioned and transomed oak window with good original casement catches". In 1973, and despite its Grade II listed status, No. 196 High Street was completely demolished by Exeter City Council to build the High Street entrance into the Guildhall Shopping Centre left. Incredibly, no architectural record was made of the property either before or during its destruction. However, under the foundations of the Elizabethan house archaeologists did discover the remains of Saxon or Norman timber buildings. 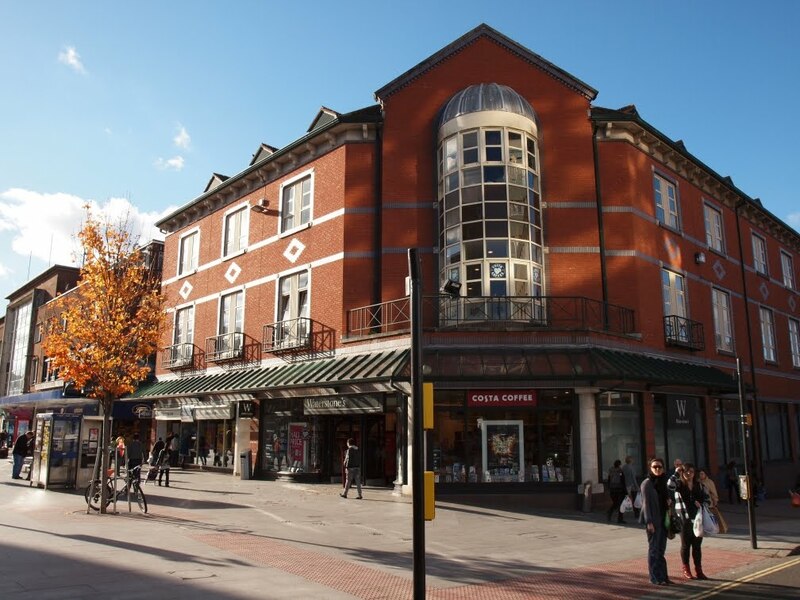 Incidentally, Denecke and Shaw's 1988 book, 'Urban Historical Georgraphy: Recent Progess in Britain and Germany', is entirely incorrect when it states that the entrance into the shopping centre from the High Street was created "using existing streets and retaining the original buildings". Apart from No. 196, two other historical buildings (Nos. 197 and 198, both originally constructed as a matching pair) were destroyed in order to create the entrance. The only parts of the structure remaining today are the overmantel and window. The overmantel is made from plaster and almost certainly dates to the last few years of the reign of Elizabeth I e.g. 1585 - 1603. The coat of arms of Elizabeth I is easily recognisable: the three lions of England quartered with the French fleur de lis supported by an English lion rampant and a dragon representing Wales. Similar examples once existed in Exeter at the Abbot's Lodge and No. 229 High Street. The two caryatids on either side consist of sculpted busts atop classical pedestals. Never common, even when it was first installed, the overmantel is now a rare survival in Exeter. The manager in H Samuel kindly let me take photos of these Elizabethan fragments, some more of which are shown below. 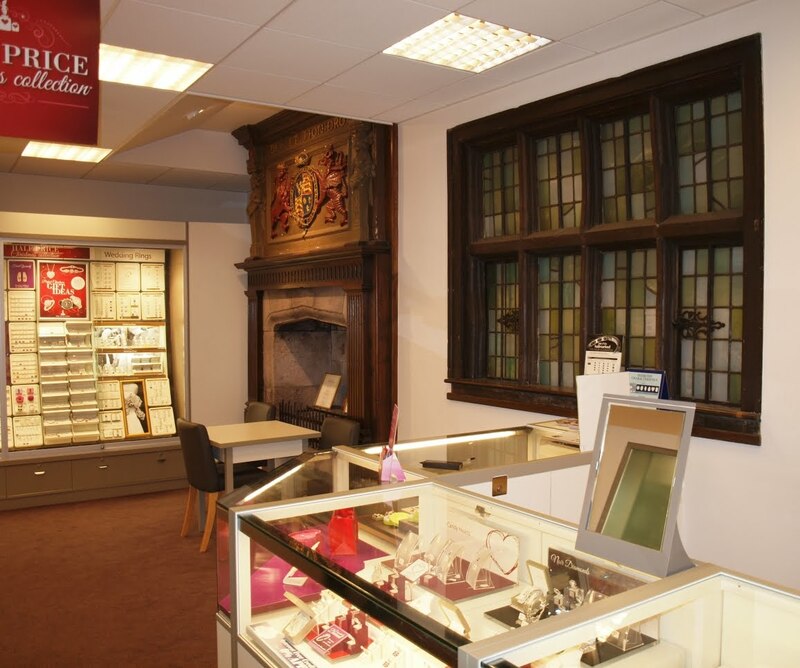 The last photograph shows the exterior of the shop where the overmantel and window can currently be seen. Everything else dates from the 1970s. No. 229 High Street was one of Exeter's most important Elizabethan townhouses but it was completely demolished in 1930, the exceptional Tudor and Jacobean interiors flogged off to William Randolph Hearst in the United States. 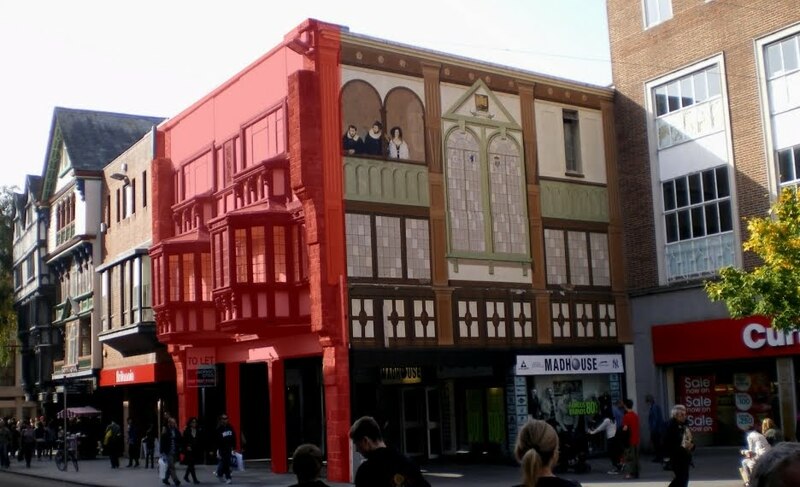 At least the building which replaced it, above and highlighted in red c1932, attempted to blend into the overall appearance of Exeter's historic High Street. One wonders why a 16th century townhouse was replaced with an imitation early-17th century townhouse but the new building certainly looked old even if it wasn't. The external firewalls at the sides were constructed from stone in a style similar to Nos. 41 & 42 further down the High Street. The two gables overlooking the High Street were both given timber-framed decoration, below which were two second-floor oriel windows. Both these windows and the enormous five-sided bay windows on the first-floor dated from the early 1600s and were reclaimed from No. 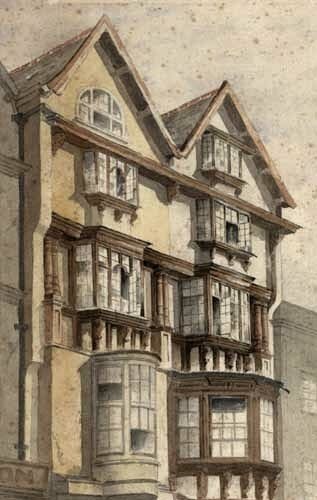 20 North Street when it was demolished at the end of the 19th century (one of the windows was actually a copy as only a single window was reclaimed from No. 20. The matching window at No. 19 North Street had disappeared by 1827). So the building was only a pastiche with some genuine components in the facade salvaged from another house, but the overall appearance maintained the visual interest of this side of the High Street, complimenting a number of genuine examples which still survived intact. The photograph above shows No. 229 High Street today, almost unrecognisable as the same building. This marked the western boundary of the war-damaged High Street. 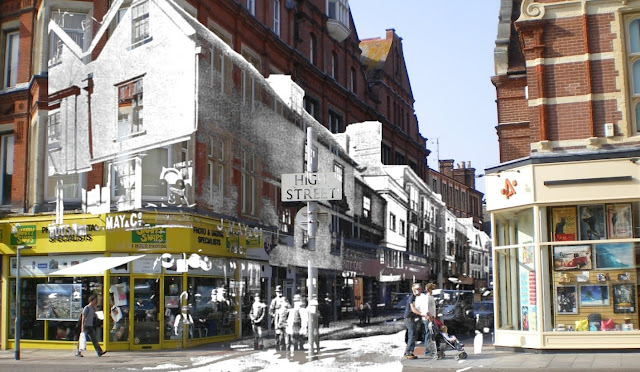 The photograph illustrates how the post-war widening of the High Street pushed the line of the street back almost to the rear of No. 229, the exposed wall now covered with a mural. During the Blitz of 04 May 1942 fire spread from burning properties nearby into the roof of No. 229, destroying the two gables and the small oriel windows on the second floor. The large five-sided windows somehow survived and during the post-war reconstruction the building was refurbished, and what an utter mess was made of it. 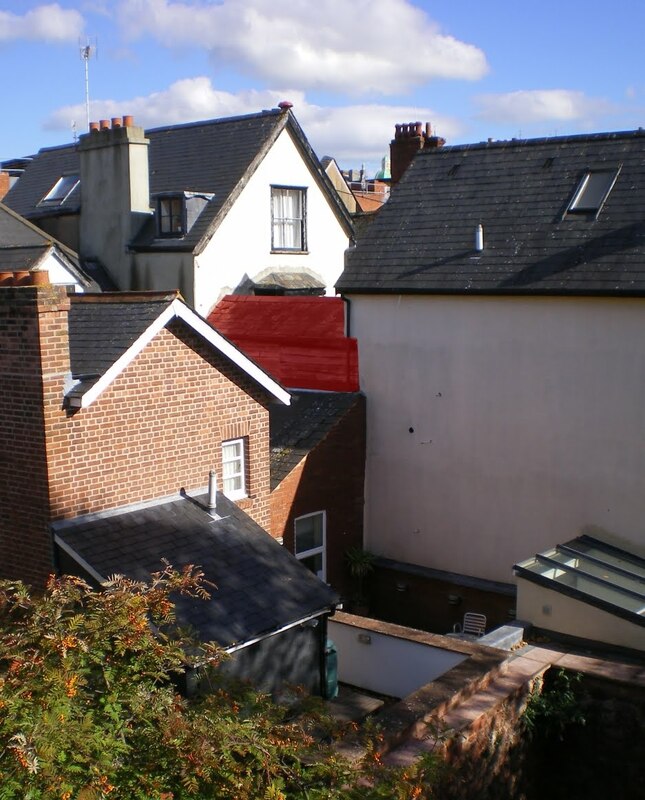 The burnt-out oriel windows were replaced with steel replacements and the two gables was replaced with a flat roof!! They managed to make an acceptable pastiche look like a 1950s block with some oriel windows shoved into the facade. How much extra effort would it really have taken to rebuild the gable roof?? 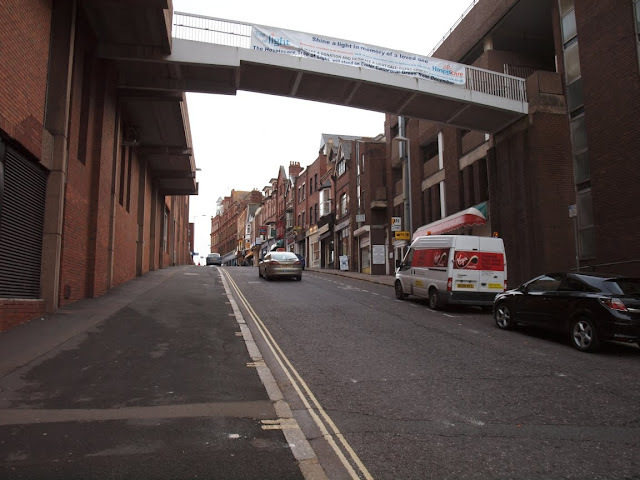 The ground floor shop was gutted to provide a walkway underneath the first floor which now overhangs the pavement. Anyway, No. 229 today marks the point where the post-war reconstruction of the upper High Street really began. Although it was only built in 1930 No. 229 is the oldest building from this point eastwards for nearly half-a-mile (excluding St Stephen's church on the other side of the street). Of the rest of the pre-war High Street, and most of Sidwell Street, nothing remains. The mural on the side of No. 229 today was painted in 1993 and shows three famous Exonians from the late-16th and early-17th century: Nicholas Hilliard, Thomas Bodley and Princess Henrietta Maria, born at Bedford House in 1644. (Edit: this mural has now been destroyed.) The photograph above left shows the view eastwards from No. 229, looking up the vast banal expanse of the rebuilt High Street. As Pevsner and Cherry state: "One is plunged into a mediocre post-war world, long dull ranges on each side...a total break with the character of the old town". Or, as Gavin Stamp put it: "largely inappropriate, incoherent and dismal". The images below show some details from the oriel windows which once belonged to No. 20 North Street and which are now part of the sad facade of No. 229 High Street. They give some idea of the spectacular quality of the building from which they were salvaged. Nos. 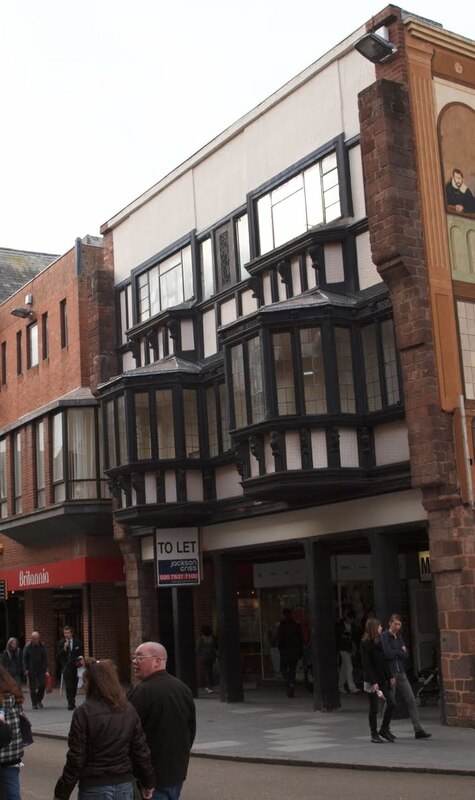 19 and 20 North Street were two of the most prestigious Jacobean timber-framed townhouses in Exeter. Having survived since the early 1600s, they were both demolished for road-widening c1890. A publication called the Archaeological Review mentioned in 1889 that "No. 20 North Street is going to be pulled down for the purpose of widening the street", and the house seems to have been destroyed shortly afterwards. The image left © Devon County Council shows both properties c1889, just prior to their demolition. Nos. 19 and 20 were probably two individual houses built at the same time as a matching pair, the unity of the facades being disrupted by additions made in the 18th or 19th century to the front of No. 19. Stylistic similarities show that the facade was certainly constructed over the fronts of both properties at the same time. 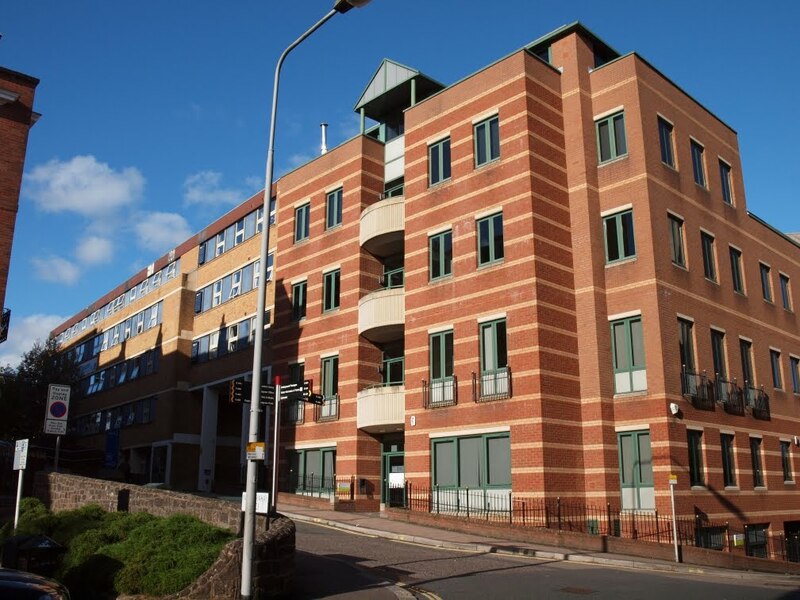 Building two houses as a pair was a fairly common occurrence in Exeter during the 16th and 17th centuries and was something of an Exeter speciality. In 1890, both houses consisted of five floors and a cellar and towered over the narrow street outside. Projecting out from the first floor of No. 20 was a spectacular five-sided oriel window, supported underneath by nine carved oak corbels depicting various beasts, including unicorns, and grotesque figures. No. 19 almost certainly had a similar oriel window when originally built which, by at least 1827, had been replaced by a simpler bow-fronted window. The facade of the first and second floors of both Nos. 19 and 20 was subdivided vertically by the inclusion of moulded oak columns, six sets of two. On the second floor both houses had matching six-light oriel windows, again supported on carved oak corbels, with another pair of oriel windows on the third floor. The whole arrangement was finished on the fourth floor by yet another four-light oriel window set into the gable, although by 1890 the fourth floor window of No. 19 had been replaced with a simpler semi-circular window. At the time of their demolition they probably exceeded even the Chevalier inn on Fore Street as examples of their kind. In fact they were probably the finest timber-framed frontages still left in city. 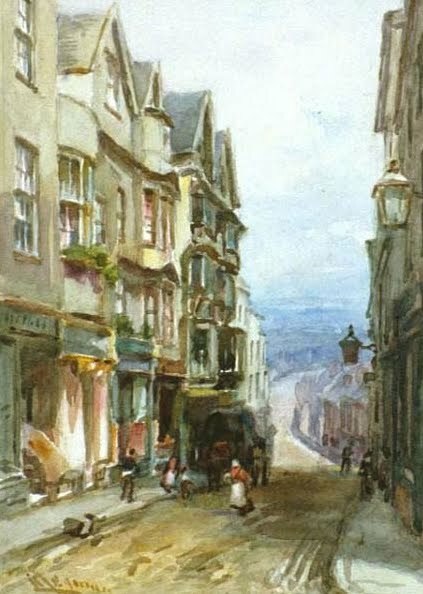 The architect and antiquarian, James Crocker, described and sketched both properties for his 1886 publication "Sketches of Old Exeter" left. 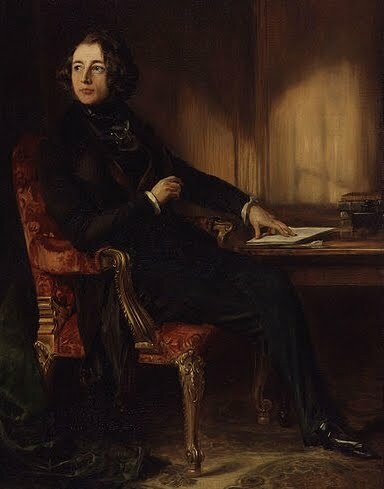 He was justifiably scathing in his criticism of the alterations which had been carried out to the windows of No. 19: "It is to me", he wrote, "a source of the greatest marvel that any person, however ignorant or indifferent, could persuade themselves to substitute the hideous bow window on the first floor, for what they must have destroyed in order to find a place for their own wretched handiwork". The magnificent array of oriel windows, the decorative use of oak columns and sculpted woodwork, and the sheer enormity of the building itself, indicates that these was once the exceptional properties of exceptionally wealthy citizens, probably merchants involved in the lucrative woollen cloth trade. As far as I know there are no records of what remained inside, but it's possible that decorative plasterwork ceilings, panelling and ornate fireplaces remained even as late as the 1890s. Had it survived it would rank today as one of the finest buildings of its type in the west of England. It appears that No. 19 was sold to the City Council in 1894 for £600. (The City Council either had to wait and buy properties as and when they came on the market, or make the owner an offer. Once bought and in the Council's possession it was then just a matter of demolishing it.) By 1900, both buildings had been completely demolished. A similar fate befall No. 38 North Street as late as 1972. Some fragments of the houses do remain today. The five-sided oriel window from No. 20, along with a few other fragments of carved oak, was relocated into a new building at No. 229 High Street in the 1930s right. Since only one window was salvaged the other window installed into the facade of No. 229 is a copy, although it's difficult to tell which is which. A photograph of No. 19 North Street can be seen here. No. 19 is the tall house with the semi-circular window in the gable. No. 20 had already been demolished when the photograph was taken. The two Jacobean houses to the left of No. 19 are Nos. 17 and 18 shown prior to the destruction of their facades. Other than that, not a trace of these two buildings remain. They were replaced with two brick-built houses of no architectural merit (the two properties to the far left in the photograph below). It would be interesting to know if the city authorities had any qualms about the destruction of Nos. 19 and 20, whether there was any hand-wringing or soul-searching, or whether, as I suspect is likely, the houses were regarded as nothing more than an inconvenient obstacle to the city's development. Despite a century of the almost continual destruction of Exeter's historical architecture, during the slum clearances of the 1920s and 1930s, during World War Two, during the much-criticised post-war reconstruction, during the creation of the city's inner ring road and the massive Exe Bridges traffic management system in the 1960s, incredibly, after all historical buildings were still being demolished. In the early 1970s the local authority decide to destroy some of the last remaining medieval properties left within the circuit of the city walls. The destruction of No. 38, North Street in 1972 was inexcusable on every level. The west side of North Street, mostly consisting of 16th and 17th century timber-framed houses, had already been completely defaced and/or demolished by 1900, but prior to 1972 the east side retained at least three properties which dated to the 1500s or earlier, as well as the 17th century tavern known as the Elephant Inn. 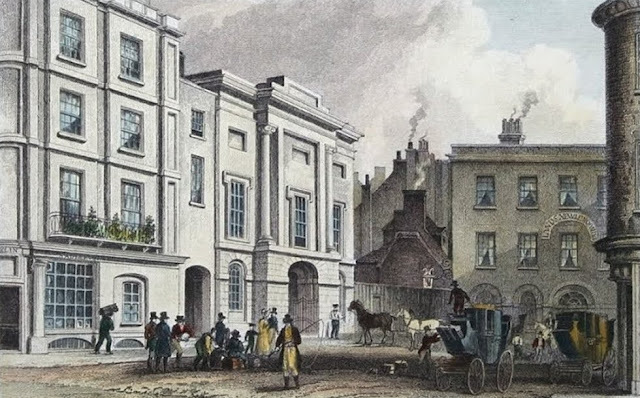 And yet almost the entire east side of the street, including all of the remaining historically important buildings, was demolished to build the monstrous Guildhall Shopping Centre. The history of No. 38 is long and complicated. Exeter's most important 20th century historian, W. G. Hoskins, who examined the property ten years before its destruction, described it as being "a good example internally of a 15th century dwelling house of a particularly wealthy merchant". It probably dated to c1500. Until its demolition it was the finest example in the city of the building arrangement known as 'gallery and back block', an unusual floor plan peculiar to south-west England in which an accommodation block on the street front was joined to a kitchen block at the rear by a gallery which spanned a courtyard lying between the two blocks (the best remaining example in Exeter now is probably the much reduced specimen at No. 18, North Street). 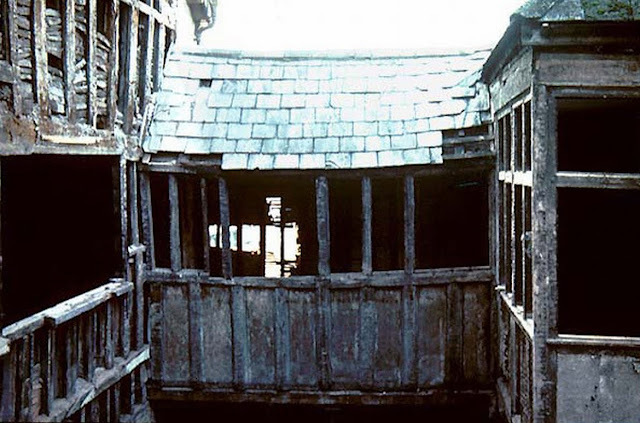 The photograph above © RAMM shows the early 17th century timber-framed construction of the gallery at No. 38 North Street during its demolition in 1972. The main house is to the left with the back block at the rear. Internally there was a small late-15th century hall in the centre of the property, extending from the ground floor to the roof with blocks of rooms on either side. According to Derek Portman, who examined the property in the 1960s, the hall had retained its "very fine arch-braced roof". A number of medieval fireplaces also survived, including a massive example in the kitchen block at the rear. The house underwent modifications in the first half of the 17th century. A new timber-framed facade, described by Hoskins as one of the finest left in the city, was added c1650 (a photograph of the facade just prior to its destruction can be seen here). Another 17th century addition, dating to c1630, was an important decorative plaster ceiling with a complex design of motifs featuring animals and foliage. At the start of the 20th century there were a number of similar ceilings in Exeter but by the 1970s the example at No. 38 was one of the only ones of its type to survive within the city. The photograph above © RAMM shows part of the plasterwork ceiling during demolition. As it was being destroyed, bits of the ceiling were collected as fragments by the Royal Albert Memorial Museum. More information on this ceiling can be found here. During the 18th century some rebuilding took place at the rear of No. 38, but the building was essentially a medieval merchant's house with 17th century alterations. The facade had in fact been removed in 1899 to allow for yet more road-widening when the building was known as the Eagle Brewery. 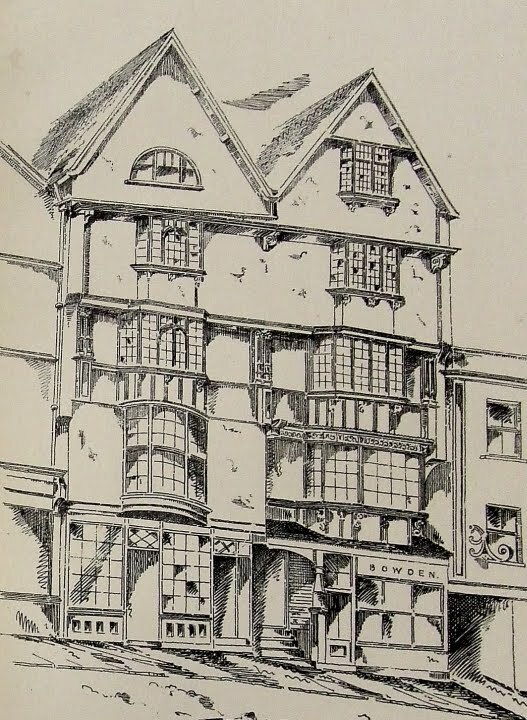 An account of the removal of the facade appeared in an edition of Trewman's 'Exeter Flying Post' dated 20 May 1899. According to the report, the walls on either side of the property were made of stone. These were firewalls, built not only to support the sides of the house and a place for the installation of fireplaces and chimneys but also to prevent fire spreading between neighbouring properties. This firewall showed signs that at one time the front of the building projected out into the street, "in accordance with the practice followed in the days of narrow streets" and would've dated to the 15th century. The plasterwork ceiling, mentioned above, was "richly moulded in a kind of star pattern, suggesting the famous star chamber at Westminster." Half of the ornate Jacobean plasterwork was removed at this time and ended up at Lew Trenchard in the home of the Reverend Sabine Baring-Gould (where it can still be seen today). The other half remained in situ and the mid-17th century facade was reconstructed, piece by piece, by the property's owner. Despite the efforts of Hoskins and others, No. 38, North Street was completely demolished in 1972. The construction of the Guildhall Shopping Centre destroyed everything: the ornamented facade and plaster ceiling of the 1630s, the medieval walls, the arch-braced roof structure and mullioned windows, the timber-framed gallery, the moulded beams and fireplaces. Nos. 34 and 35, dating to the mid-16th century, were also demolished at the same time along with the 17th century 'Elephant Inn' and No. 36, an almost identical merchant's house from the late-15th century which also had a fine arch-braced roof. The site where these buildings once stood is shown right, and this is the city which was once frequently regarded as amongst the most picturesque and attractive in southern England. Compared with many other historic English cathedral cities, Exeter today is architecturally disappointing, to say the least. Perhaps many of the buildings which were destroyed during World War Two would've succumbed to the wrecking ball of the local authority anyway. Would Bedford Circus really have survived into the 21st century even if it hadn't been damaged in 1942? Or would the allure of the retail value of the land on which it stood have proved too tempting to resist? I'm not aware of another example of two almost adjacent 15th century arch-braced roofs being demolished as late as 1972 anywhere in England. 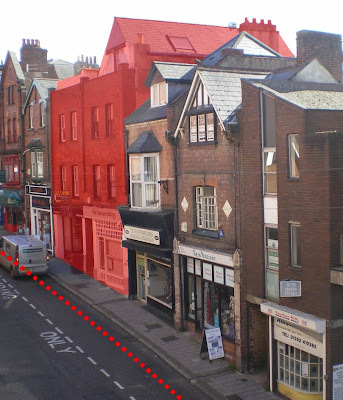 Either way, the mindless demolition of this small group of historic buildings in North Street was a complete disgrace and nothing more than cultural vandalism inflicted upon the city by the very people who were supposed to be its custodians. 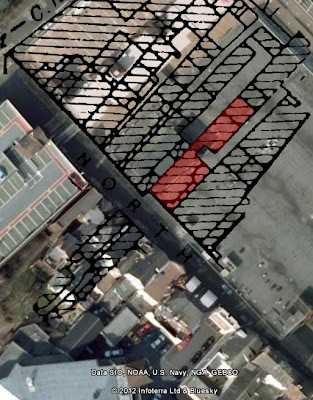 They look like late-19th century structures today, but behind the plain brick facades of Nos. 17 and 18 lie two of Exeter's few remaining 17th century timber-framed merchant houses. 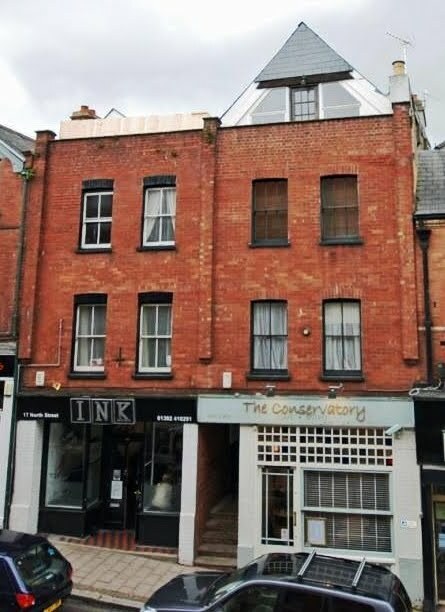 Both houses had survived intact until the end of the 19th century when the city authorities hacked off 8ft of the frontage to widen the road in North Street. The facades of the early 1600s were replaced with the brick elevations visible today. The photograph right shows Nos. 17 & 18 highlighted in red, the original line of the demolished facades shown as a red dotted line. Both Nos. 17 and 18 were originally constructed with four floors with a cellar, the destroyed facade of No. 18 being particularly fine with projecting pedimented oriel windows on the first and second floors. The exterior arrangement of No. 17 had been altered in the 18th century with the insertion of sash windows. A fire at No. 18 in 1995 exposed some previously hidden painted wooden panelling. The panelling was removed for conservation, partially funded by Exeter City Council, and subjected to dendrochronology ordered by English Heritage in July 2008. A felling date of between 1573 and 1609 was suggested for the oak boards, consistent with a construction date for the building of c1600. As well as the panelling, No. 18 also retains at least one original early-17th century fireplace, lined with the local purple volcanic rock and a late-17th century staircase. Another important surviving feature of No. 18 is the panel-lined passageway left that runs underneath the building and which still provides entry into the house itself. The oak partitioning, with ovolo mouldings and chamfered rails, is contemporary with the early-17th century construction of the house. The steps up into the passageway are visible in the photograph at the top of this post. It is the only example of its kind left in the entire city but at one time such passageways would've been widespread. No. 18 has now been converted into flats, with a restaurant on the ground floor. No. 17 also has several original features, including a 17th century staircase, although the gallery and back block plan is missing. It is a great pity that these two buildings didn't make it into the 20th century without having their facades ripped off and the front rooms destroyed. 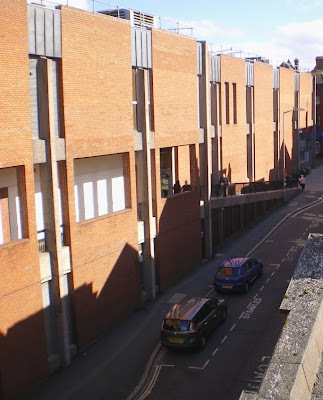 Today they stare out at the inane brick cliff of the Guildhall Shopping Centre and I would suspect that most people who drive past them every day have little idea that they are important relics from Exeter's past. At least they did survive, even in their mutilated condition, which is more than can be said for nearly all of the buildings on the other side of the street. The photograph right shows the gallery and back block arrangement at No. 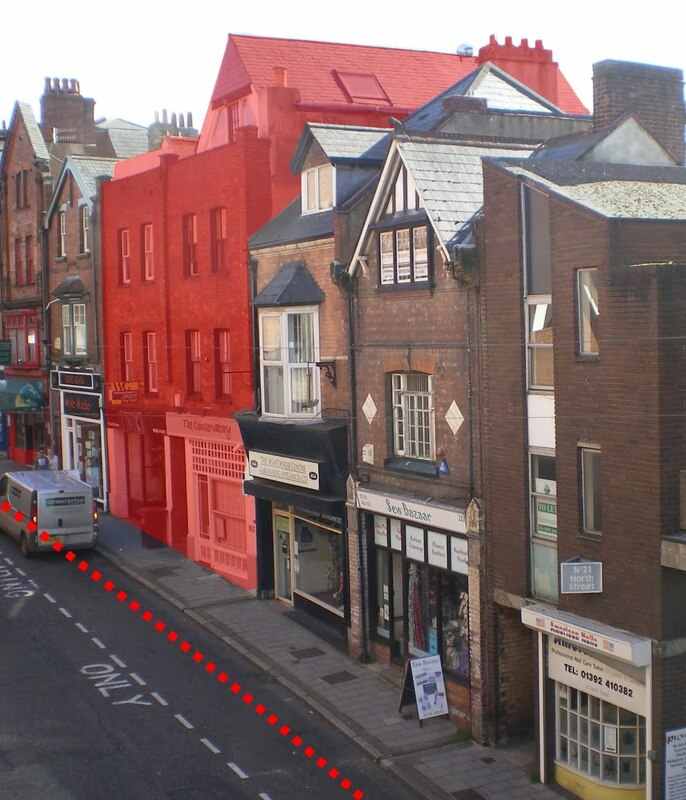 18 North Street, the gallery itself highlighted in red, the block a replacement of the 17th century structure which was destroyed in 1942. The original back block was approximately 28ft long and 16ft wide, with three of its walls built of Heavitree breccia and the fourth, the one facing the house, constructed from timber-framing. The connecting gallery is particularly important as it consists of two stories, an arrangement which is today unique in the city. I don't have Copyright access to any photos showing Nos. 17 & 18 in their original state but there is one available to view online here. It shows the view down North Street c1890 (note the narrowness of the street prior to road-widening). Nos. 17 & 18 are the two tall gabled houses to the left.The magnificent property to the right of them, with the semi-circular window set into the gable end, is No. 19. It was completely demolished soon after this photograph was taken. No. 20, with a similar facade, had already been destroyed. It is extraordinary that such remarkable buildings were so casually disposed of. With so little surviving in Exeter the best place to see intact examples of 16th and 17th century houses with the distinctive 'gallery and back block' arrangement is now probably in Totnes, approximately 23 miles south-west of Exeter. This small town has 66 domestic houses which have been shown to date from before 1700 and many of them represent the type of layout which was once relatively common in Exeter. 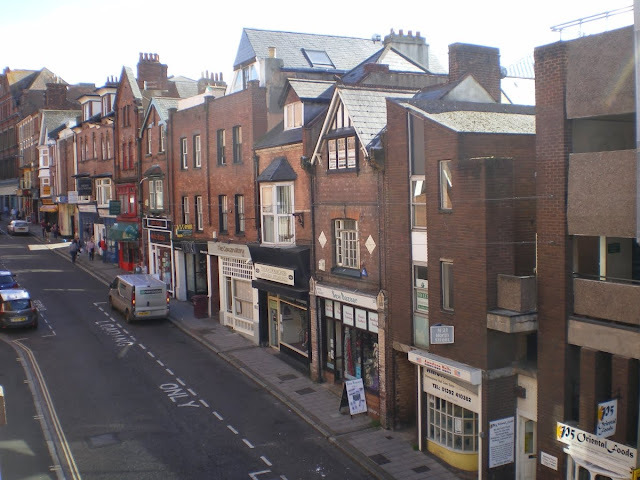 North Street is yet another of Exeter's four principal medieval thoroughfares in which very little architecture of historic interest can be seen today. The fragments that do remain lie hidden behind the mean late-19th century brick facades, and the destruction here has absolutely nothing to do with World War Two as almost the entire street survived the Blitz of 1942 unscathed. 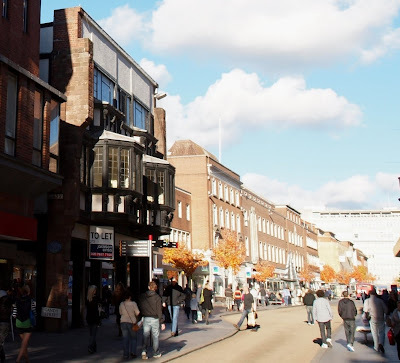 The route of North Street itself dates to the late 9th century and was laid out as part of Alfred the Great's refounding of the city in the 890s (a number of other streets in Exeter were created at this time, including Catherine Street and Gandy Street). The map above dates to 1587. Highlighted in red are the buildings that fronted onto North Street, the North Gate visible where the street was bounded by the city wall, the tower of the medieval chuch of St Kerrian in the middle and, at the street's southern end, the great medieval water conduit that stood at the Carfoix, the crossroads where the High Street, North Street, South Street and Fore Street met. 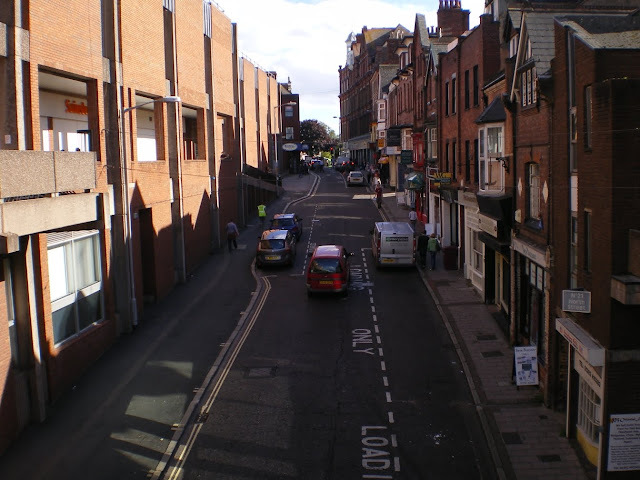 North street, also known as Northgate Street, was once much steeper than at present. The Longbrook stream ran through a deep valley on this side of the city, beyond the line of the city wall. Both the steep-sided valley and the stream acted as a natural defensive barrier to the northern approach into Exeter. Anyone entering the city from the north would've had to climb up the side of the valley, passing under the medieval North Gate, before tackling the long haul up North Street to reach the plateau upon which the historic city centre was situated. The image below left © Devon County Council shows the west side of North Street c1840 looking down towards the newly completed Iron Bridge. The two tall townhouses on the left were Nos. 19 and 20. In the mid-1830s a fine iron bridge was built to cross the Longbrook valley, making access into the city much less arduous, although the ancient North Gate was removed in 1769. 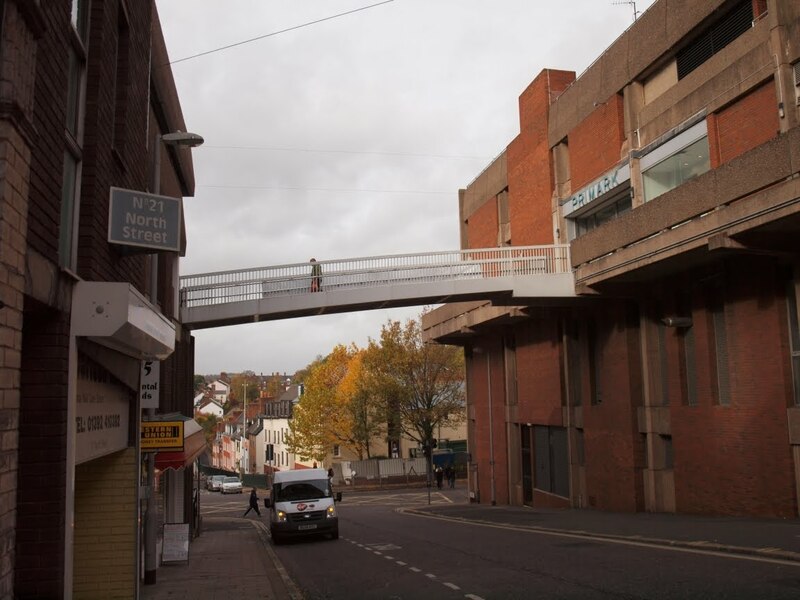 Changes to the street level over the last 150 years have served to remove the steepness of the road, but the severity of the gradient into Exeter can still be gauged in Lower North Street, beyond the city walls, which lies below the level of the Iron Bridge. For heavily-laden carts in bad weather the road up into the city must've been almost impassable. Several notable buildings were once situated on North Street, including the ancient church dedicated to the Celtic St Kerrian (demolished in 1878), the George Inn, first mentioned in 1578, the Black Dog Inn, and the 17th century Elephant Inn (demolished in the 1970s), but North Street in the 15th, 16th and 17th centuries was primarily the home of a number of Exeter's exceptionally wealthy woollen cloth merchants, and the testament to their wealth were the extraordinary houses in which they lived. 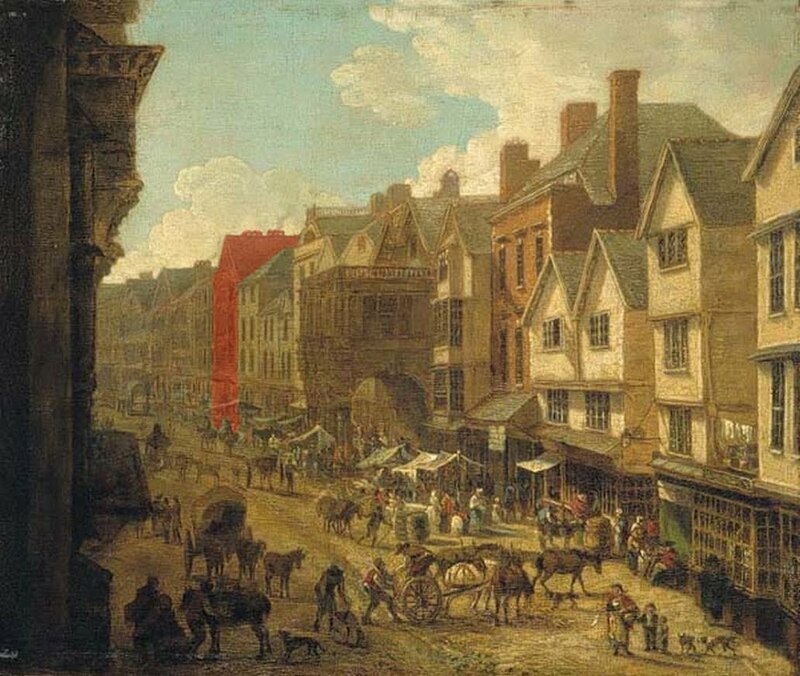 During the 16th century the serge cloth market was held in North Street before being relocated to South Street in 1591 and in the 1670s the parish of St Kerrian, which encompassed much of North Street, was one of the most affluent in the entire city. 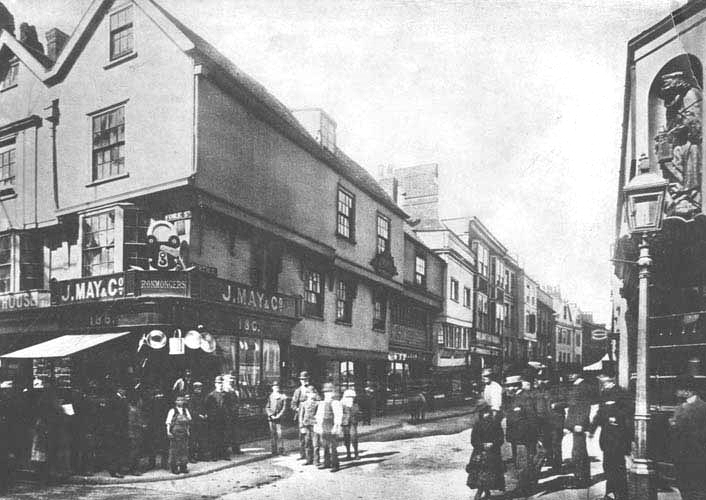 The image right © Devon County Council shows North Street c1880, just prior to the destruction of the surviving timber-frame facades visible on the left. The medieval narrowness of the street combined with the increased usage of horse-drawn carriages at the end of the 18th century proved to be an issue for the city authorities, and as early as 1818 part of the street was demolished in order to widen the road. But little else was altered and when the photograph at the top of this post was taken, c1880, the street still retained much of its 16th and 17th century character. The image shows the entrance into North Street from the High Street, North Street itself lined with a number of jettied, timber-framed houses. The house to the left on the corner, No. 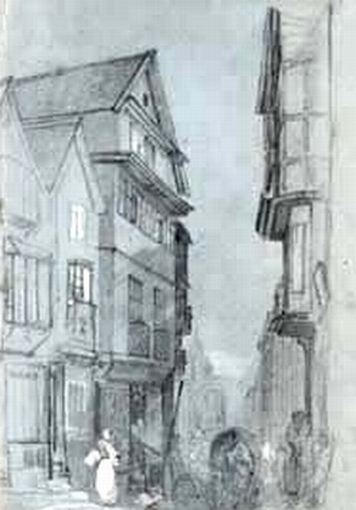 186 Fore Street, dated to c1500 and had some notable wooden traceried windows. The oak statue of St Peter, inset into a niche within the facade of the house on the right, dated from the 15th century. 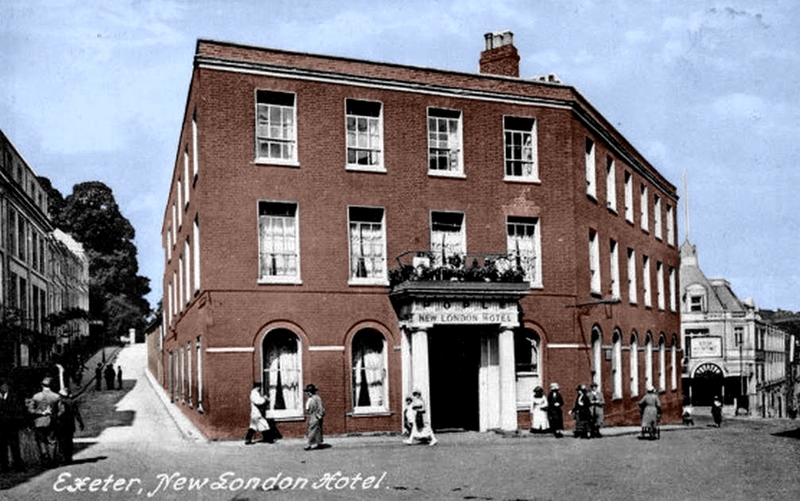 Of the buildings shown all but one has since been demolished, and even that is now hidden beneath a late-19th century brick frontage. The width of the street was still regarded as being too narrow in the 1890s and so the city authorities decided to embark on a lengthy road-widening operation. Up until this time the west side of the street had retained a significant number of townhouses dating from at least the 17th century. Two especially, Nos. 19 and 20, were both towering, multi-jettied houses bristling with carved oriel windows and were among the finest timber-framed facades ever built in the city. 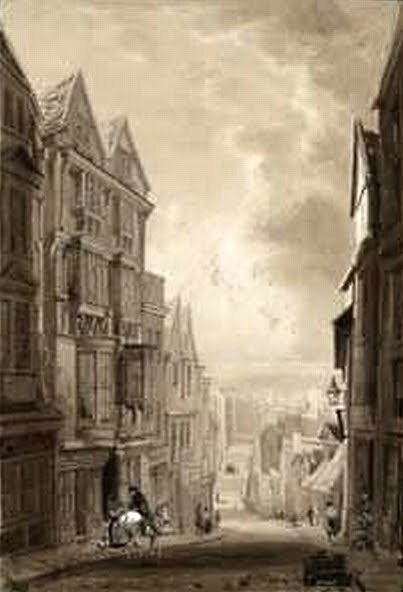 The drawing shown left © Devon County Council dates to c1830 and shows the top of the street near its junction with South Street and the High Street. Neither their age, their history or their spectacular facades would save them and they were both completely demolished c1895 (fragments of the projecting oriel windows were later reset into a building on the High Street). The two adjacent houses, Nos. 17 & 18, were of a similar period, slightly plainer in style, but this time the city authorities didn't opt for total demolition. Instead a long saw was used to remove the timber-framed facades to a depth of 8ft and the early-17th century frontages were replaced with brick. This process of demolition continued all the way up the side of the street to the junction with Fore Street (most of the timber-framed buildings here had already been destroyed by fire in 1882). A report in Trewman's 'Exeter Flying Post' dated 15 December 1900 gives an account of the on-going demolition: "The front portions of the premises Nos. 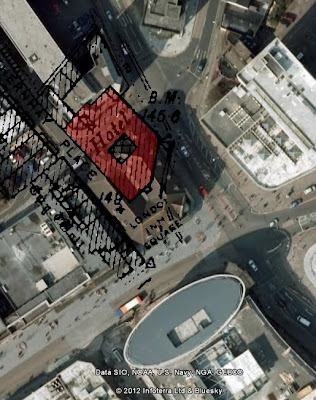 14 and 15...have been pulled down this week, and the ancient but irregular thoroughfare will by and bye be accorded a further extension of the widening process which has been in operation from time to time for a good many years now." The report continues, "the property which has been razed this week possessed no such architectural or antiquarian value as attached to some other shops formerly standing in the street." By 1910 all the houses on the west side (shown above as they appear today) had either been demolished or totally disfigured by the addition of brick facades to their timber-framed carcasses. The east side of North Street remained relatively unscathed, although the historic properties here were fewer in number and several were demolished and replaced over the course of the 19th century. A large area at the rear of the houses on the west side of North Street, once the site of the George Inn, was bulldozed in the 1930s to build a cinema called the Gaumont, now the 'Mecca Bingo' hall. 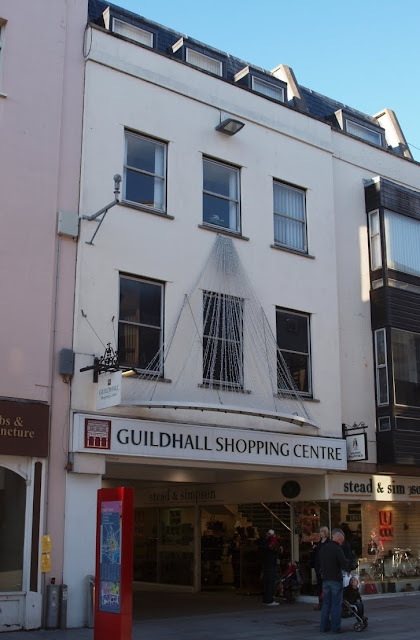 But the final act in the destruction of North Street only began in the early 1970s when the city council decided to build the Guildhall Shopping Centre as part of the 'Golden Heart' project. The Council's own conservation report for the area now calls the action "regrettable" as the project involved the complete destruction of nearly all of the remaining historic properties on the east side of North Street. Among the buildings demolished for the shopping centre were the 17th century 'Elephant Inn', two mid-16th century properties and two important medieval merchant houses dating from the late-1400s, complete with their intact arch-braced hall roofs. One of these was No. 36 North Street. The other, No. 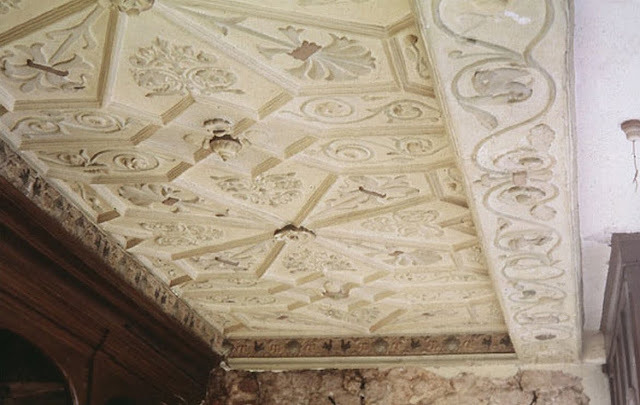 38 North Street, had the finest early-17th century decorative plasterwork ceiling left in the city and was fronted by an important timber-framed facade from the mid-1600s. No. 44 North Street was another Grade II listed building. Dating to c1800 it had unusual iron balconies. It too was destroyed. No. 33 North Street was recorded in 1931 as having plasterwork ceilings behind a rebuilt facade. It was also destroyed. It is no exaggeration to suggest that by the 1970s, thanks to slum clearances, the Blitz, post-war reconstruction and further demolition there was relatively little of historic Exeter left to destroy, the majority of the city centre comprising of buildings that were less than 50 years-old. The fact that the local authority so casually destroyed some of the oldest domestic houses in the city is nothing short of staggering. Local historian Hugh Meller rightly said that the 1970s rebuilding, above left, was "catastrophic". Bridget Cherry called it "disastrous". The late-19th century brick facades are grim enough but the monolithic 1970s brick slab that now forms the east side of North Street is an appalling blemish on the face of the city. Peter Thomas calls it "grim and forbidding" with "prison-like walls". The council's conservation report manages to come up with the words "unwelcoming" and "alien". I can think of a dozen others, none of which would adequately describe the appearance of North Street today. 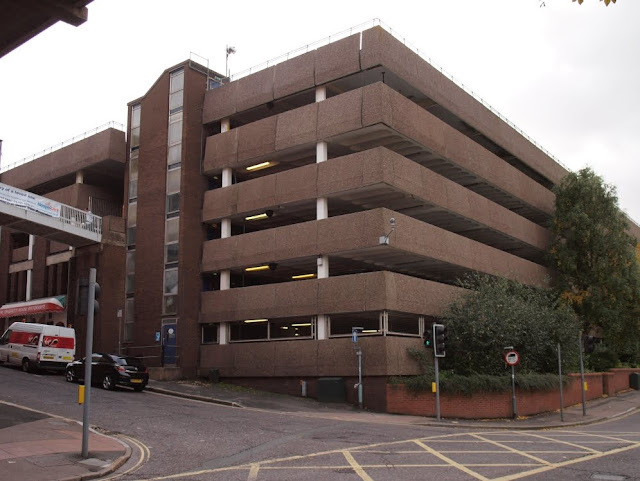 It is dirty, unattractive, often choked with cars, reeking of exhaust fumes and dominated by the brick cliff of the shopping centre. It represents the very worst of post-war town-planning combined with the most revolting examples of Modernist architecture. As if the Guildhall Shopping Centre wasn't intrusive enough the redevelopment was capped off with the construction of the accompanying Brutalist car park that squats over the corner of North Street with Bartholomew Street East above and which is almost the first thing you see when approaching the city centre from the north. It all beggars belief that any of this was an acceptable addition to a historic cathedral city which had already been so badly mauled. North Street today is one of the least appealing parts of a city that is unfortunately hardly short of visually unappealing townscapes. If any of the people shown in the photograph at the top of this post could see North Street they would literally not recognise a single building. The image below shows how the entrance into North Street from the High Street c1880 would look today if it had survived intact.